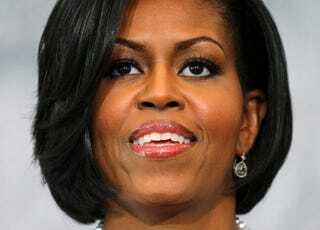 First lady Michelle Obama helps kids keep track of Santa. First lady Michelle Obama helped kids keep track of Santa during her Christmas vacation. When her husband, President Barack Obama, and daughters, Sasha and Malia, went to the beach on their Christmas vacation in Hawaii, the first lady stayed behind to answer calls from children trying to pinpoint Santa's whereabouts. She spent approximately 40 minutes talking to kids on NORAD's Santa hot line. NORAD, a U.S.-and-Canadian military organization for aerospace and maritime defense, says it uses radar, satellites, high-speed digital cameras and fighter jets to track Santa. It displays a global map showing Santa's progress, along with links to satellite video of Santa's sleigh flying by and holiday games in seven languages. Some kids wanted toys, and others asked questions about Mrs. Obama, like if it's hard being married to the president. She answered, "No, he's a pretty good guy," and "I mean, it's a tough job, and sometimes you want to do everything you can to help him, but it's pretty easy being married to him. He's kind of funny — fun to hang out with." For that answer and helping kids believe in Santa, the first lady appears to be a pretty cool person, too.